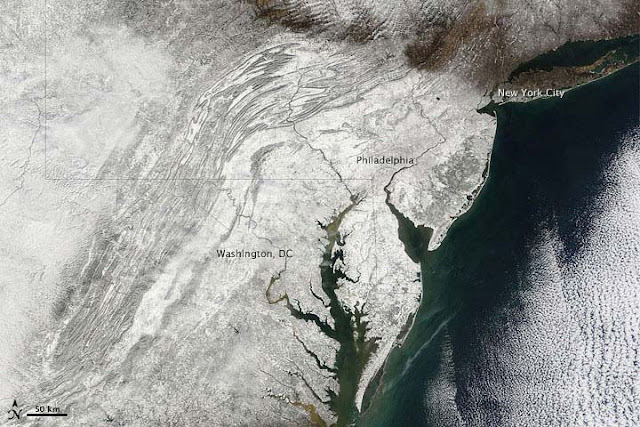 This is what Snowpocalypse, Part I, of last Friday looked like from space. The new one starting last night and continuing past the next midnight will be far worse. UPDATE: Snowpoc ended at 9 pm tonight, with a total of 16 inches in 25 hours here where I live 30 miles from Princeton and Columbia. Not too shabby. The worst since April 7, 1983 or something, when 23 inches fell in like 9 hours (beginning at 2pm in order to particularly screw working men and women).